While visiting friends in Normandy, our taste buds were delighted by a refreshing salad that truly was from the garden. My favorite thing about it is that you can prepare it ahead of time and serve it fresh from the fridge. Ideal if you like salads, but not lettuce. This recipe will make enough for four people as a side dish. Don’t be tempted to use dried herbs for this. It is the fresh herbs that make the difference. 1. Place all chopped ingredients into a bowl or container that will later be able to fit into your fridge. Pour the citrus juices over top and stir to blend. 2. 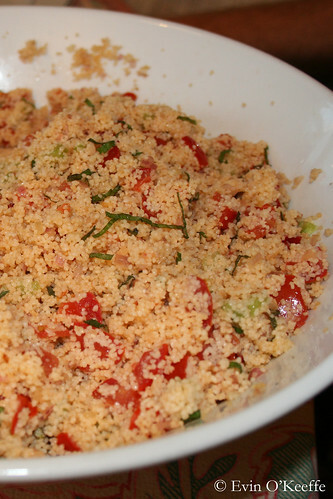 Cover and refrigerate the bowl in the fridge until within 24 hours before serving then cook the couscous. Cook the couscous according to the directions on the package and chill before mixing with the chopped medley of fruit and vegetables. 3. Once the couscous is at or below room temperature, stir into chilled citrus-soaked medley. Cover and return to fridge until time to serve. Excellent alongside grilled vegetables, fish, or meat. For variety, you can make this salad your own by switching out the tomato and celery for mango and papaya. Or keep the tomato and celery and make it a main course with cubes of cheese or even poached salmon or flakes of tuna. This entry was posted in Lunch | Dinner and tagged french food, Salad, vegan, Vegetarian.